I saw that Matt D had posted this on the ecdgc forum and thought I would help him spread the word because this a great thing he is doing. Matt, I know it would be a trek for you but,if you ever want to possibly ever have it down at ferry park, I know there would be quite a few people up for playing some night golf and helping for a good cause. With the time change upon us again, it's time to get in some Glow Golf. We'll be resurrecting the "Friday Night Flights" name for these rounds. Every other Friday starting 11/20/09. Entry Fee: one - 6" Glow Stick w/ 6 - 12 hours light life or $3 if you forget your Glow Stick and one - non perishable food item to be given to Manna Food Bank or $2 if you forget your food donation. edit: We will have a 3 disc maximum for these rounds. Choose any three you want but 3 is the maximum number you can play with. * sign up and start time subject to change as the hour darkness falls changes. I will be printing up fliers and getting them out to the area course boards a.s.a.p. As the R & B group Whodini once sang: "The Freaks Come Out At Night." I hope to see some of you frisbee freaks on Friday nights. "All the years combine...they melt into a dream..."
Looks like the Friday Glow Round is still on at UWF tommorow night (12/18/09). Tee off will be at about 7:00 pm, and we will be playing holes 1-10 twice, so no worries about getting lost in the rough on those last couple of holes. 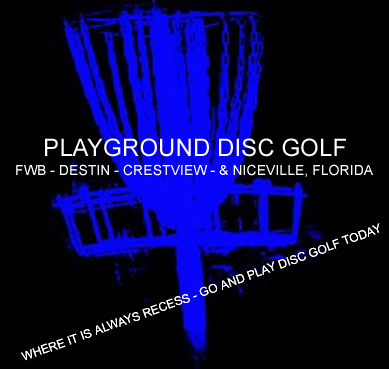 FRIDAY 1/15/2010 GLOW ROUND WILL BE AT MILTON / PJC COURSE, NOT SUNSET!!!!!!!!!!!!!!!!!!!!!!!!!! Tee off will be at 7:00 pm, and we will probably play Pirates Cove twice (20 holes with the field hole).